The Secret Garden Quito i Quito, Ecuador: Reservér nu! 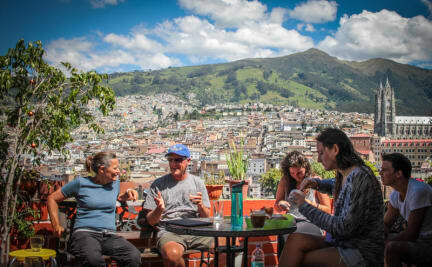 Awarded 2014 Best Hostal in Ecuador, The Secret Garden is a friendly Australian/Ecuadorian run hostel conveniently located in a quiet, authentic cobble-stone street in central colonial Quito. The rooftop terrace enjoys spectacular views of the city. It's a great place to meet fellow travellers,.enjoy the great food and drinks, or just relax with a book or the free high speed wi-fi. A second secret garden!! That's right - The Secret Garden Cotopaxi, high up in the remote Ecuadorian Andes, an ideal place to relax and use as a base to acclimatize and climb the Cotopaxi or one of the other surrounding volcanoes. IT WAS AWARDED THE BEST HOSTEL IN ECUADOR IN 2012. Perfect view and atmosphere from the rooftop terrace👌 the rooms are definitely not soundproof. But very fine private rooms 👍 and the staff is really nice. Really cool place. Amazing view and much nicer neighborhood than in the new part of the city close to plaza Foch. We had a really nice stay at the Secret Garden Hostel, the rooftop terrace is really cool to hang out on and the staff is super helpful. The only thing we were a bit dissapointed about is that there is not a kitchen where you can cook for yourself.